What is the difference between map, filter, and forEach and when should they be used? ​forEach is used when we want to run our code (3) once for each element in the original array (1) but we don't wish to create a new array (4). The ​forEach method will not give us any output, so our output variable will be undefined. forEach will never return any output. 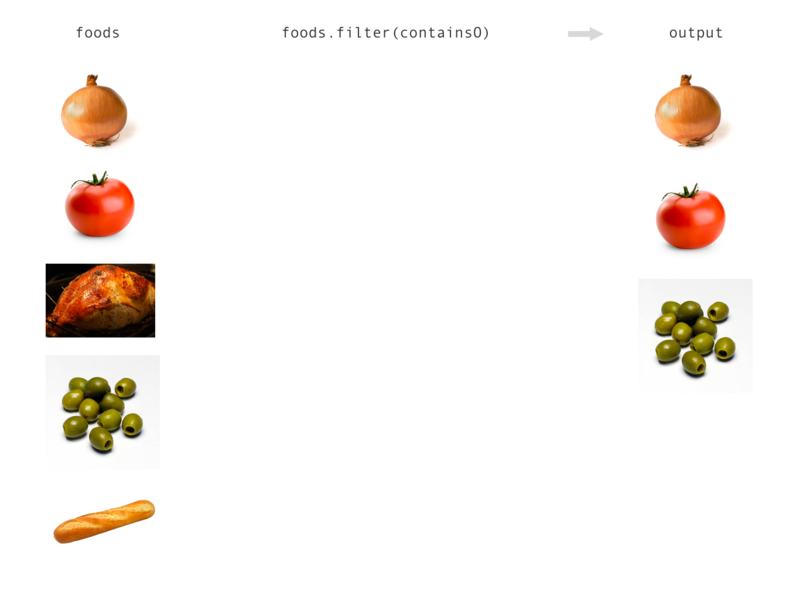 filter is used when we want to run our code (3) once per element in the original array (1) and when we want our new array to include some, but not necessarily all of elements (foods in our case) in the original array. In other words, the filter method will create a new array with some of the elements filtered out of our original array. In this case we will not get anything logged to the console, but our output (4) will be an array, not undefined like in the case of the forEach example above. The way that filter (2) works, if the code that we want to run (3) returns true (or anything that is truthy), the element will be included in our new array. If it does not return true or a truthy value, the element will not be included in our new array (4). The filter method will give us output. 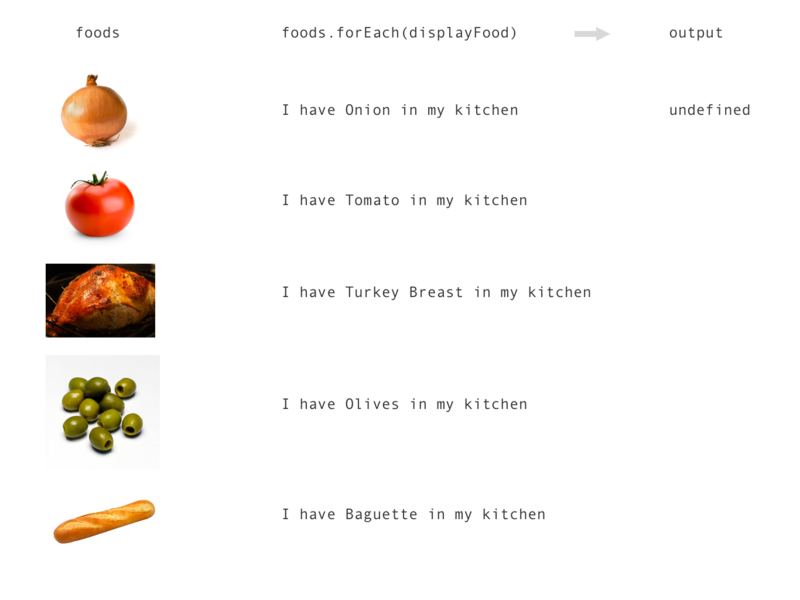 In this case our output will be foodsWithO, and it will contain each item in the original array (1) that has an "o" in it's name. map is used when we want to convert our original array into a new array with the same number of elements, but different values for those elements. For example, if we want to convert our list of raw foods into a list of sliced up foods. In this case we will not get anything logged to the console, but our output (4) will be an array, not undefined like in the case of the forEach example above. The way that map (2) works is that whatever gets returned from the code we want to run (3) will be included in the new array (output). Furthermore, the new array will appear in the same order as the original array. The map method will give us output. 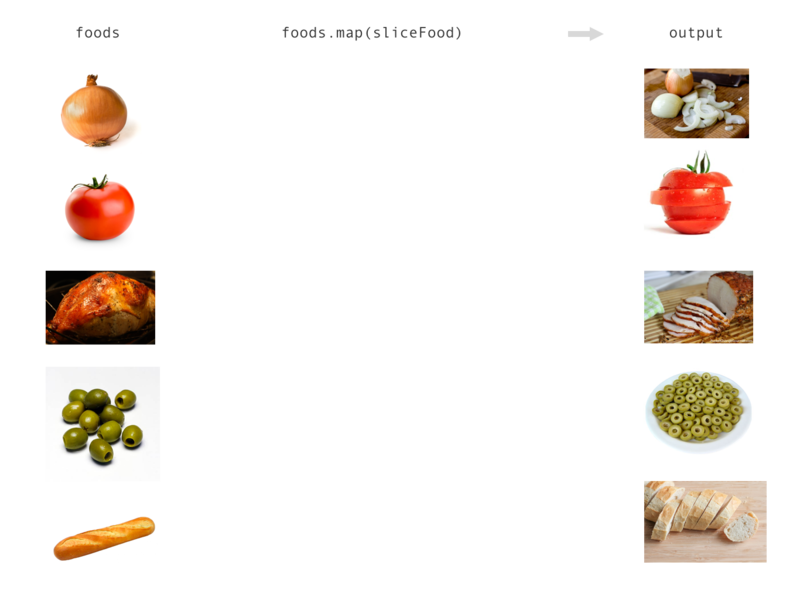 In this case our output will be slicedFoods, and it will contain each item in the original array but with the word 'Sliced' in front.